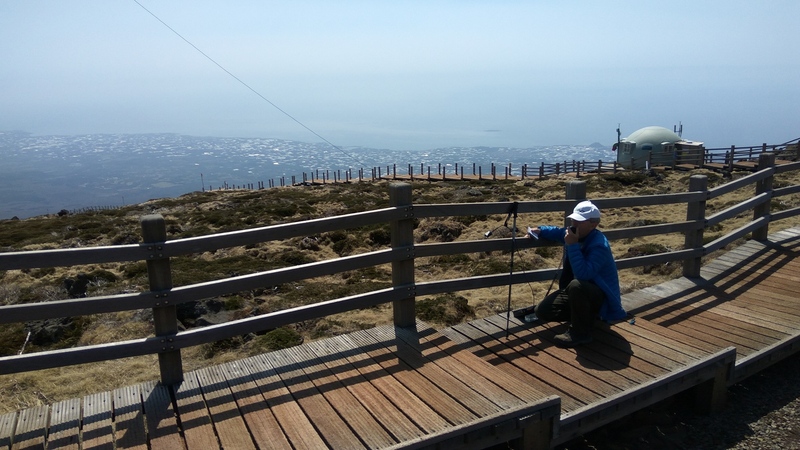 While on Jeju Island, South Korea, a hike and SOTA activation of Hallasan, HL-JJ-001 was too good to pass up. Hallasan is the highest summit in South Korea at 1950 m high. Sarah and I made an early start, leaving the hotel about 5am in Seogwipo, allowing an hour to get to the car park. 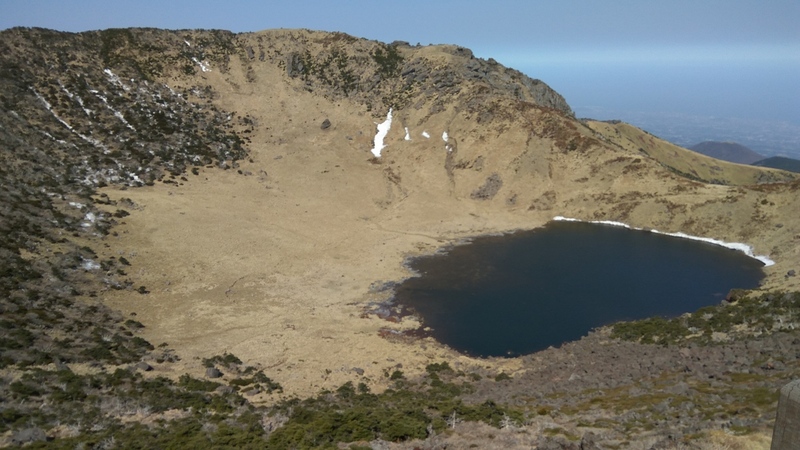 The driving travel distance was not too far, but it takes longer than you think to get around in Jeju Island due to speed limits, traffic and indirect routes caused by a volcano in the middle of the island. 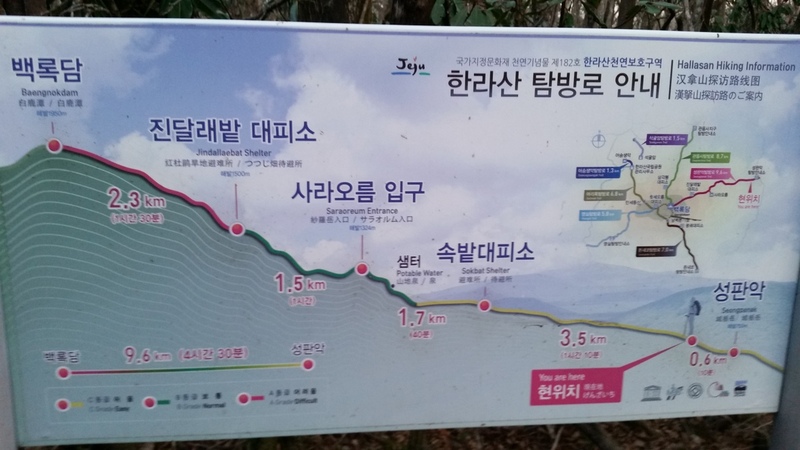 We chose the Seongpanak trail to the summit, noting that you have to be at the last checkpoint before 12:30pm to be permitted to continue to the summit. We arrived at the Hallasan car park just before 6am and the sun had not yet risen. The car park was emptier than I had imagined, I guess it was a weekday (Thursday). Our little Kia Ray rental only cost 1000 won to park (about a dollar), a normal size car would cost more. The hike is 9.6km each way and starting at an elevation of about 750 metres and rising to the summit at 1950 metres. I was hoping to arrive at the summit around 0100 UTC as this seemed to be the best time for radio propagation to the VK and ZL. 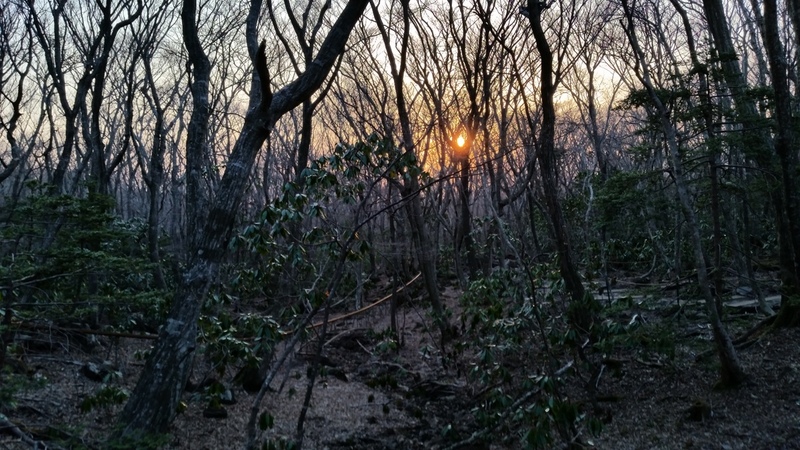 As we began the walk at 6am, the sun was just rising. The hike is pretty straight forward, although there are many sections of large rocks and it got quite hard on the ankles. Sturdy hiking boots are a must. Some sections are board walks which is nice and others are stepped sections, either of rock or timber. There are two main shelters on the way with toilets and indoor space to rest. The weather was perfect, no wind and some sunshine. 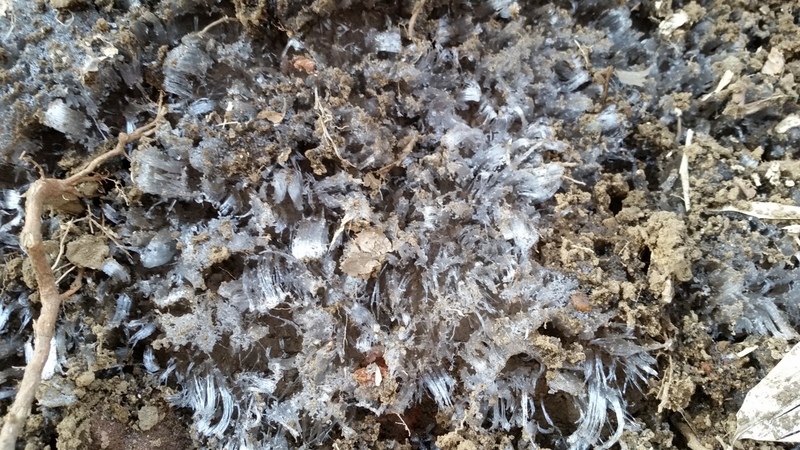 The temperature must have been below zero on the ascent as there were ice needles rising from the ground and sections of solid ice in places. There were also some drifts of snow along the way. 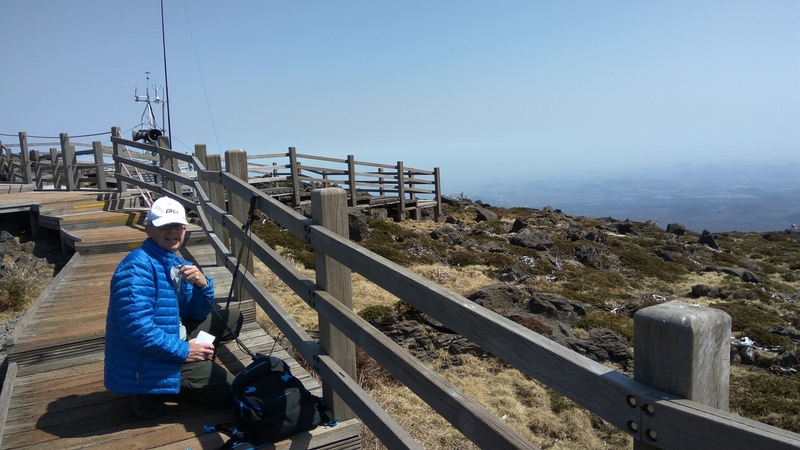 We arrived on the summit at 10:10am, which was very good time and on air by 0115 UTC. I chose 15 metres for HF as this seemed the best band for South Pacific DX. Luckily there weren’t many on the summit at this time, so I set up without worry of being in peoples way. The squid pole was bungied to a rail post and the End Fed Half Wave tied off to a hand rail further along. I only had the FT-817 barefoot with 5 Watts, so it was going to be challenging for longer distance contacts. After a couple of calls as HL1ZIB, John ZL1BYZ came back which was a relief. John’s signals were good and clear above the low noise floor, he gave me a 3×1, but signals were rising. Peter, VK3PF came back next, again with marginal signals at his end, but a contact made. VK7CW came up with a nice signal and then I went to 2 metres for a local contact with HL4MC. Returning to 15 metres, ZL2IFB was quite strong, and gave me a 5×5 and it seemed signals were still improving. At this point the summit was qualified and there were a lot of hikers starting to arrive, so thought it best to pack up and get out of their way. 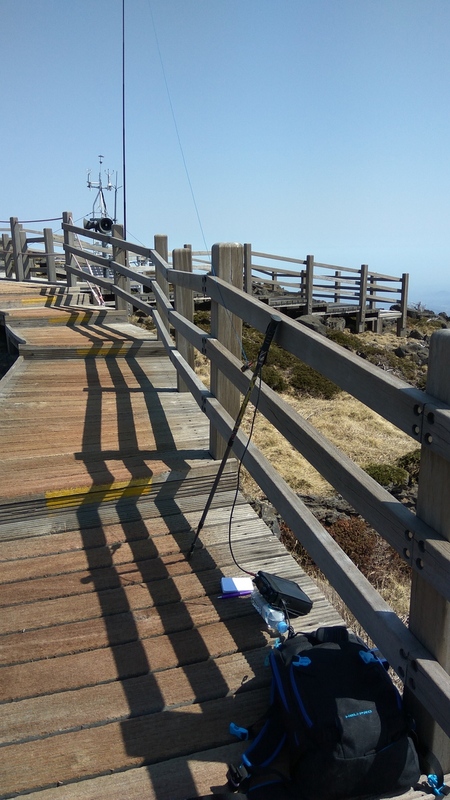 A couple of hikers were asking in broken English what the radio gear was for. I explained best I could, one of the guys knew about amateur radio. 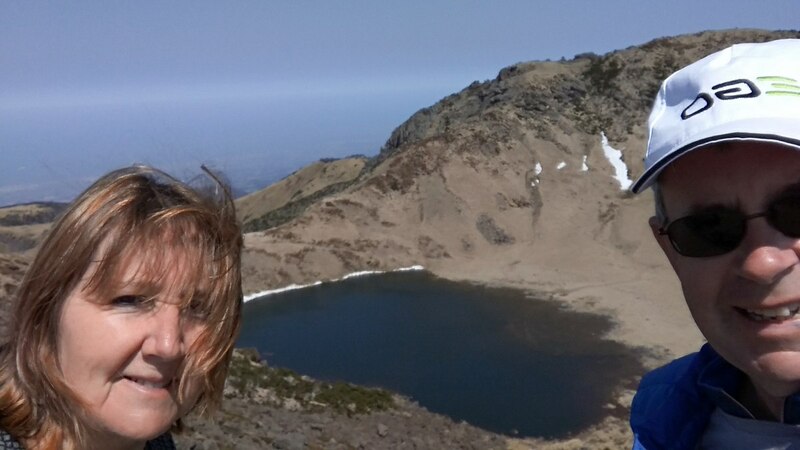 At the summit there are fantastic views and a lake in the crater of the volcano. There was a bit of snow in the crater as well. We had an early lunch and decided to leave as the traffic up the mountain was increasing. The trip down was made difficult by the number of hikers coming up the mountain and trying to make space to pass. Some of the icy sections had become very slippery and I went for a slide on one of them. Arriving at the car park, we went straight to the shop and had a big drink. I had used 3 bottles of water on the trip. The temperature was quite pleasant at the car park, probably around 16 degrees or so. 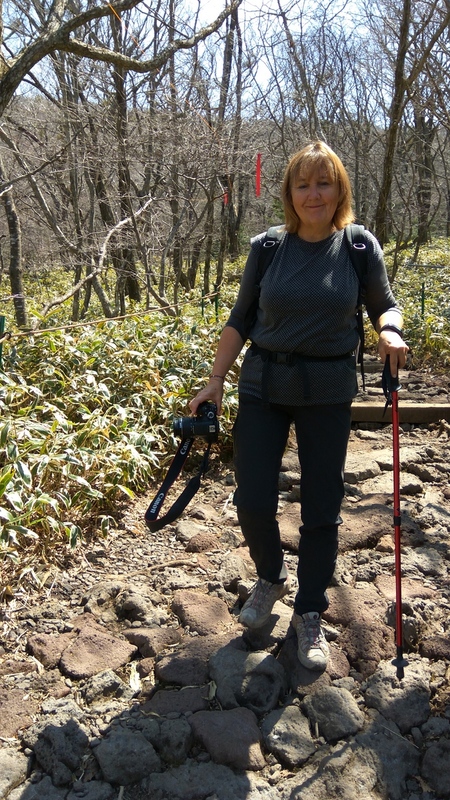 It is a great hike and glad the activation worked out OK, sorry Sarah about the longish walk! 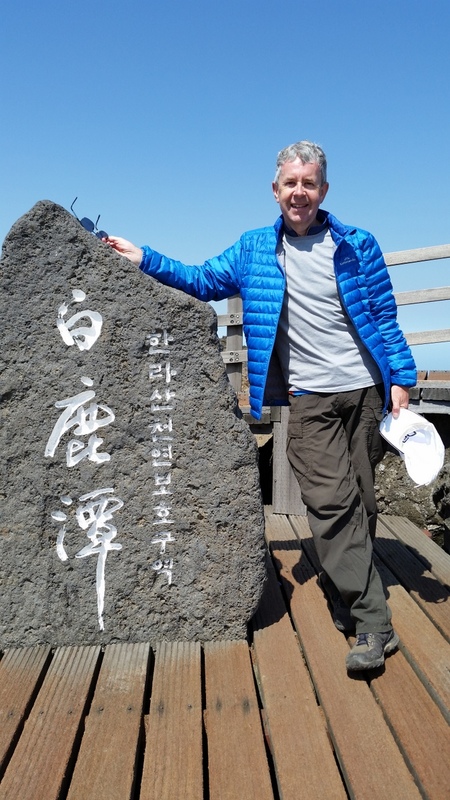 This entry was posted in Hiking, SOTA. Bookmark the permalink. A great post of a most interesting adventure. Well done on the VK and ZL contacts. Hi John, yes it was great to be able to work back to VK and ZL, nice to hear some familiar voices when so far from home.